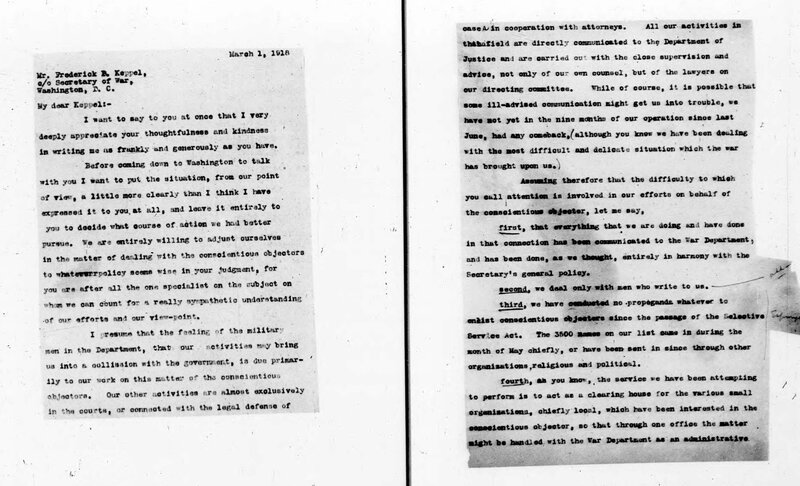 Roger Baldwin asks the National Civil Liberties Bureau person in Washington, DC on November 1, 1917 not to publicize the treatment of conscientious objects in military training camps. 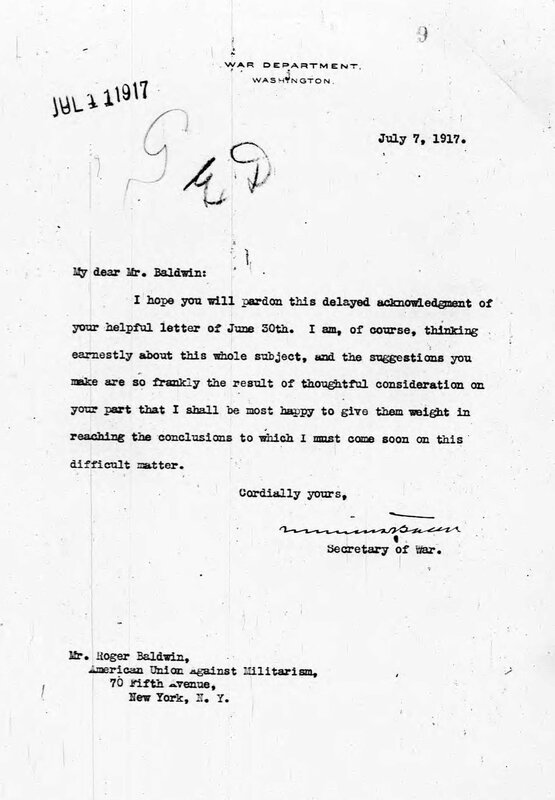 Baldwin expresses his confidence that the War Department is effectively responding to the problems. 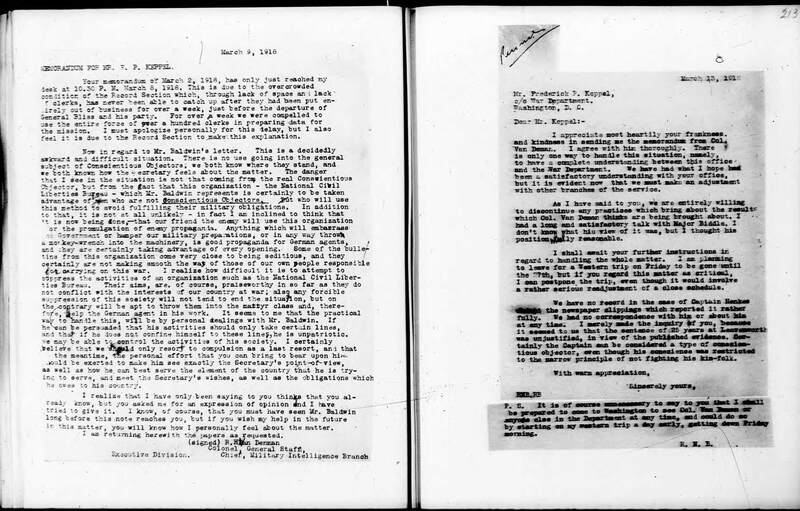 This letter from Roger Baldwin to Frederick Keppel, March 1, 1918, indicates that relations between the National Civil Liberties Bureau and the War Department had begun to deteriorate. 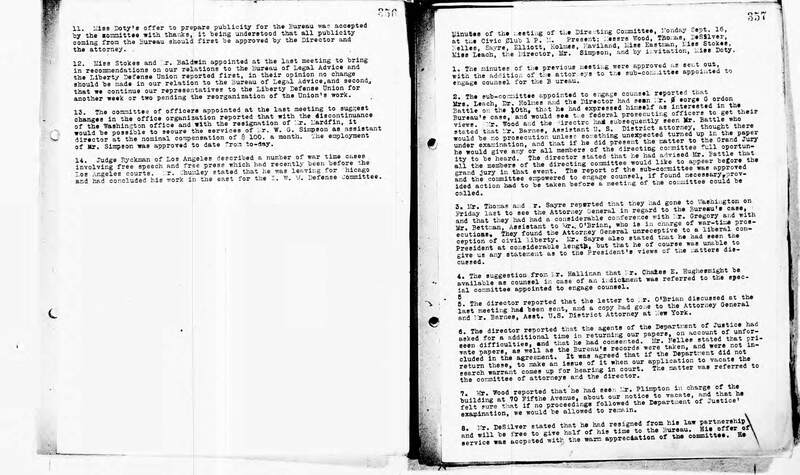 The Military Intelligence Section of the War Department was investigating the NCLB for possible violations of the Espionage Act. Baldwin pleads the case for the legitimacy of the NCLB’s activities. 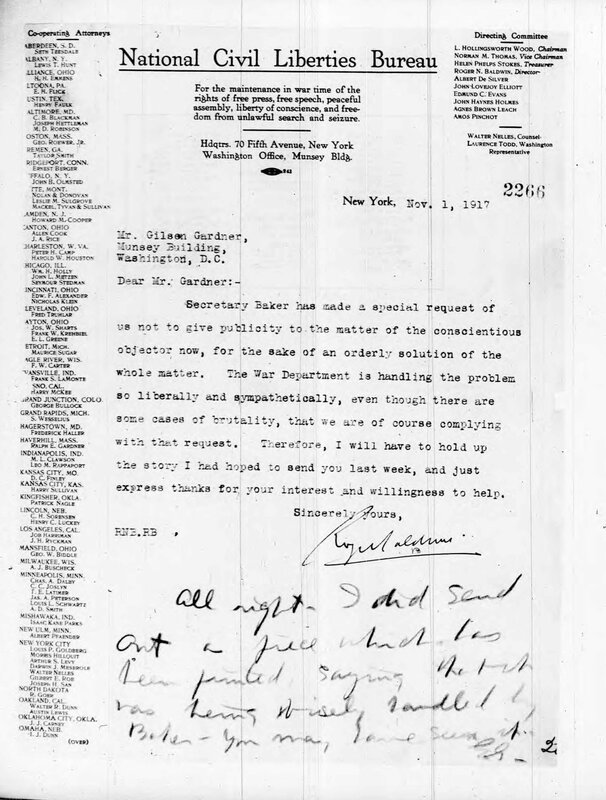 In this March 6, 1918 letter to Nicholas Biddle, of the Military Intelligence Section, Roger Baldwin offers to cooperate with the government, and encloses NCLB publications, the organization’s mailing list, financial contributors list, and list of men seeking advice about conscientious objection (see the attachment to the letter). This move, which is shocking to modern sensibilities, exposed many of the people in NCLB documents to potential prosecution under the Espionage Act. At this point, Baldwin was still naively convinced that members of the Wilson administration were people of good will who would listen to reason about the issues raised by the NCLB. 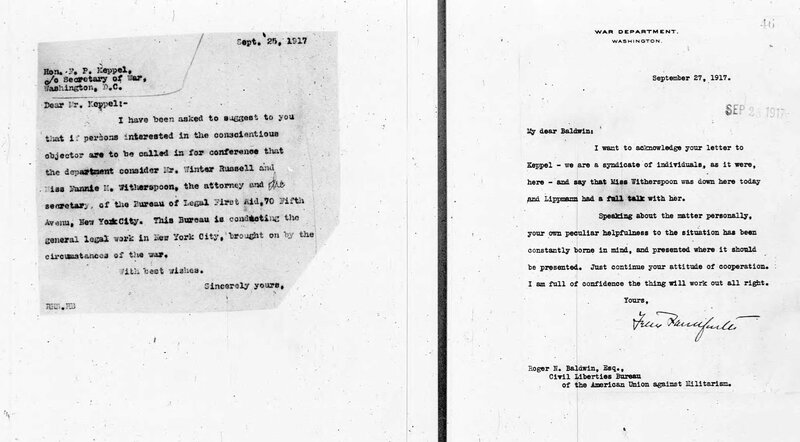 Five months later, on August 30, 1918, the Justice Department would raid the NCLB offices and seize all of its records. 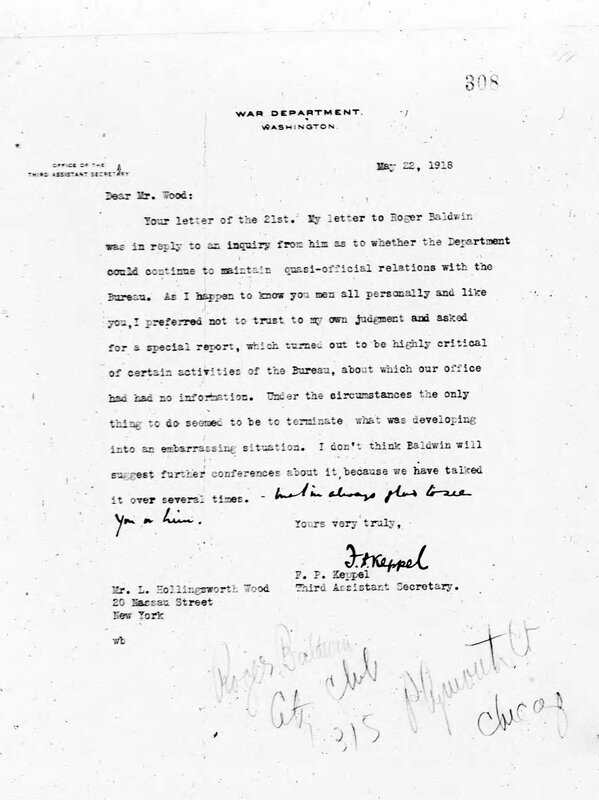 In this March 13, 1918 letter to Frederick Keppel, Roger Baldwin continues to plead the case for the Civil Liberties Bureau, and indicates his eagerness to accommodate the demands of the War Department ( “we are entirely willing to discontinue any practice” that Military Intelligence objects to). He offers to come to Washington immediately to discuss the matter if necessary. 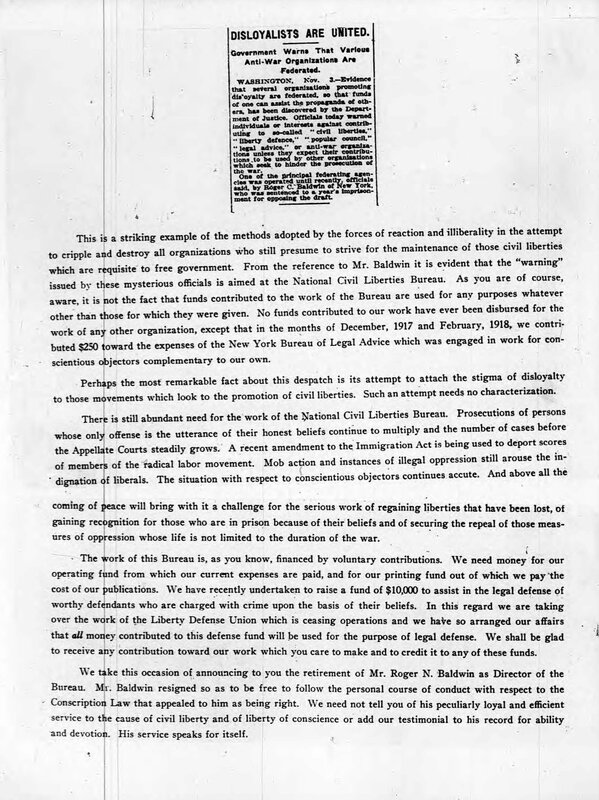 In this April 18, 1918 letter, Roger Baldwin acknowledges the criticisms of the NCLB by both Military Intelligence and some officials in the Justice Department. Interestingly, he argues that the work of the Bureau is legal because it has been conducted with the full knowledge of administration officials [including primarily Mr. Keppel, although he does not say this specifically]. He offers to “not continue this work one day longer” if it is not “helpful” to the administration. 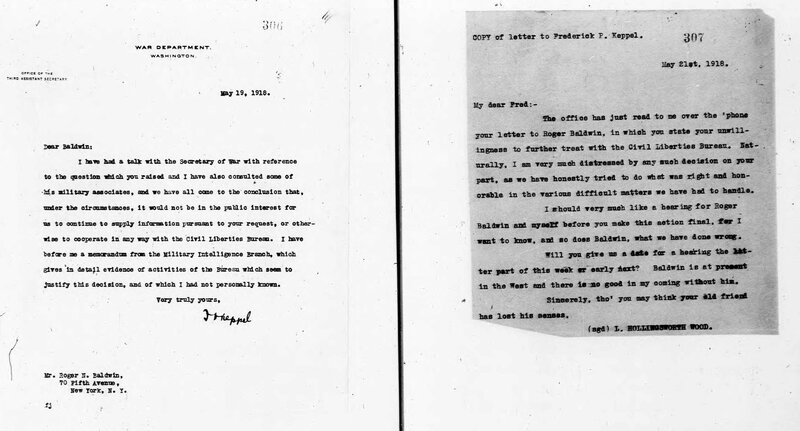 In this letter to Roger Baldwin of May 19, 1918, Frederick Keppel formally breaks his relationship with relationship with the Civil Liberties Bureau. After consulting with the Secretary of War and military authorities, he declares that it is not “in the public interest” to share information “or otherwise to cooperate” with the Bureau. 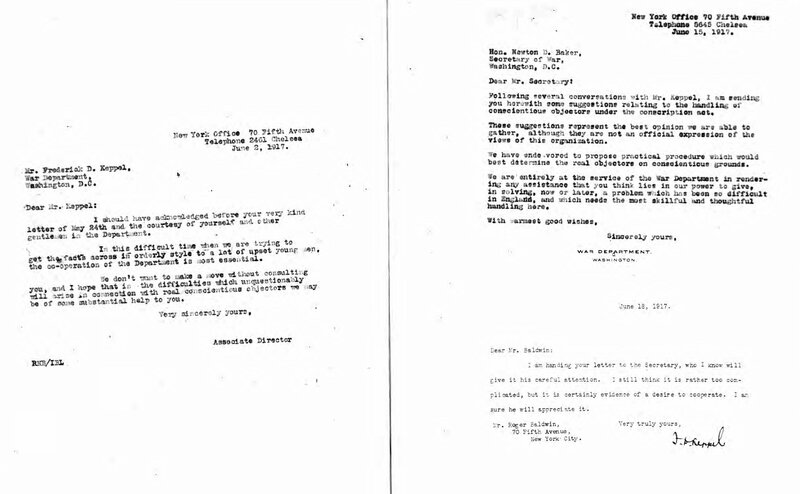 Correspondence in the following weeks, however, indicate that Keppel and other officials continued to discuss issues related to conscientious objectors. 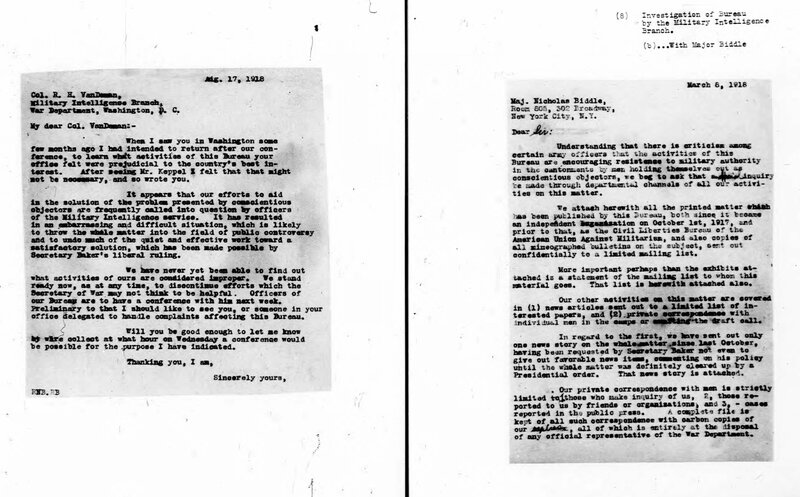 In the letter above from L. Hollingsworth Wood, Chairperson of the NCLB, to Frederick Keppel, May 21, 1918, asks for a hearing with the War Department to discuss the relations between the NCLB and the government. 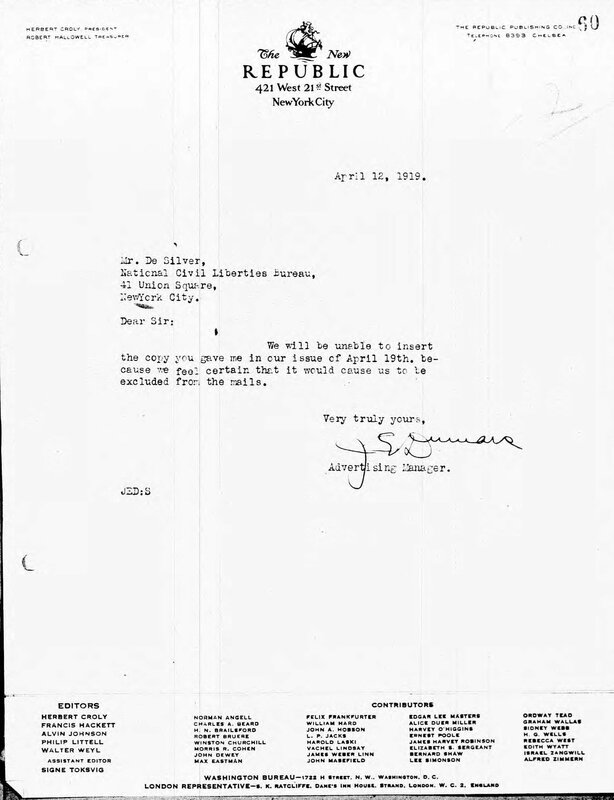 Note that he addresses the letter to “My Dear Fred,” indicating the informality of their relationship based on their pre-war progressive reform activities. 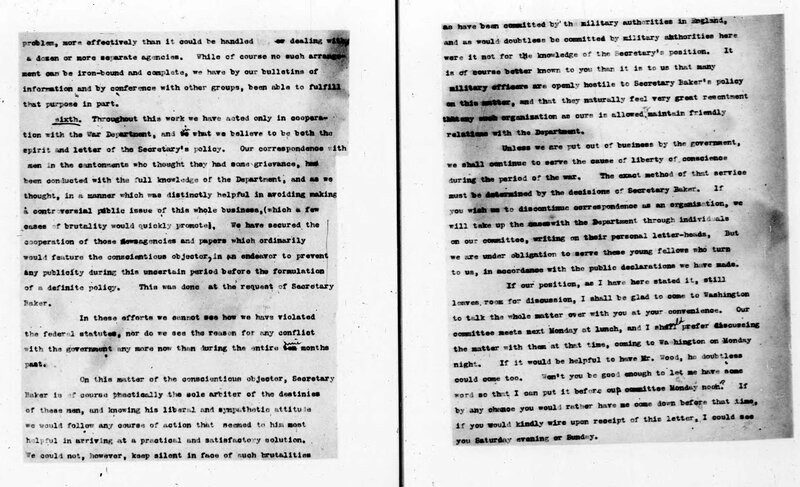 Minutes of the September 6, 1918 meeting of the NCLB Directing Committee the Justice Department following the raid on their office on August 30, 1918. 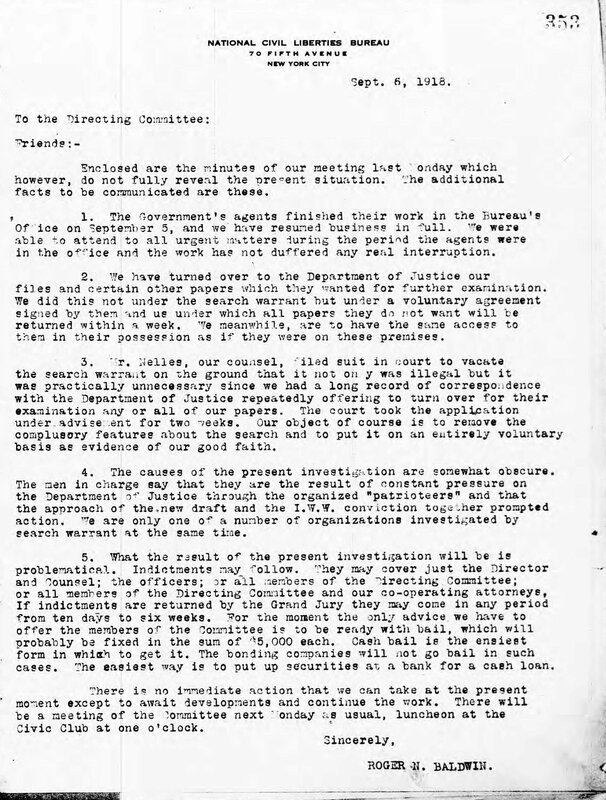 Agenda item #2 indicates that they have voluntarily turned over certain records to the Justice Department which were not covered by the Department’s search warrant. Agenda item #5 indicates concern that leaders of the organization may be prosecuted under the Espionage Act. 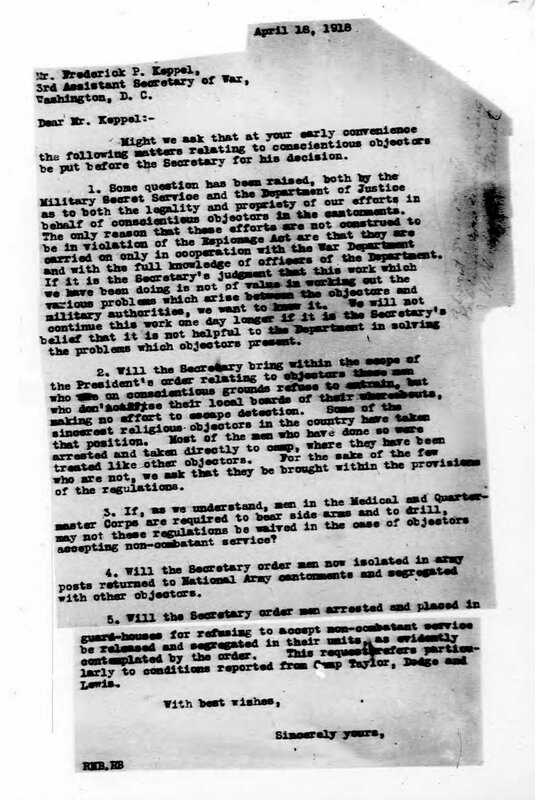 The Minutes of the September 16, 1918 meeting of the NCLB Directing Committee indicate that NCLB leaders had gone to Washington and discussed the possible prosecution of the organization with Attorney General Thomas Gregory (Item # 3). Agenda Item # 7 indicates that the NCLB’s landlord had forced them to vacate their office, which was probably a result of either private or government pressure. Interstingly, the landlord, Mr. Plimpton, was related to George Plimpton who was a noted editor and author in the 1950s and 1960s. 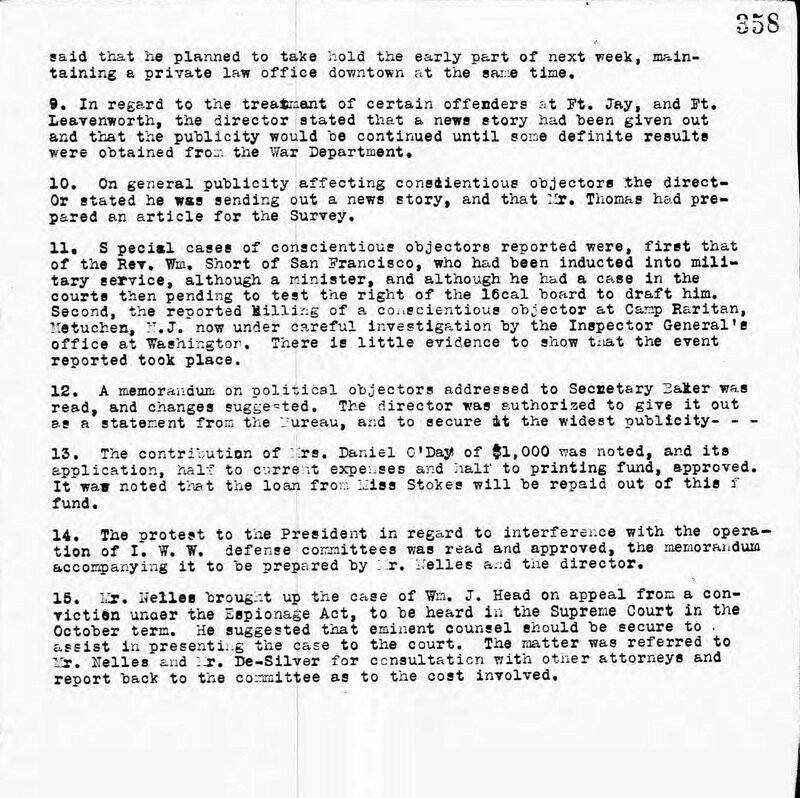 A letter from the NCLB in November 1918 (the letter in the files is incomplete) contains an article from the New York Times dated November 3 reporting that Justice Department officials had publicly warned people about contributing to “civil liberties” groups and similar organizations. The Justice Department specifically mentioned Roger Baldwin and his recent conviction for refusing to be drafted. 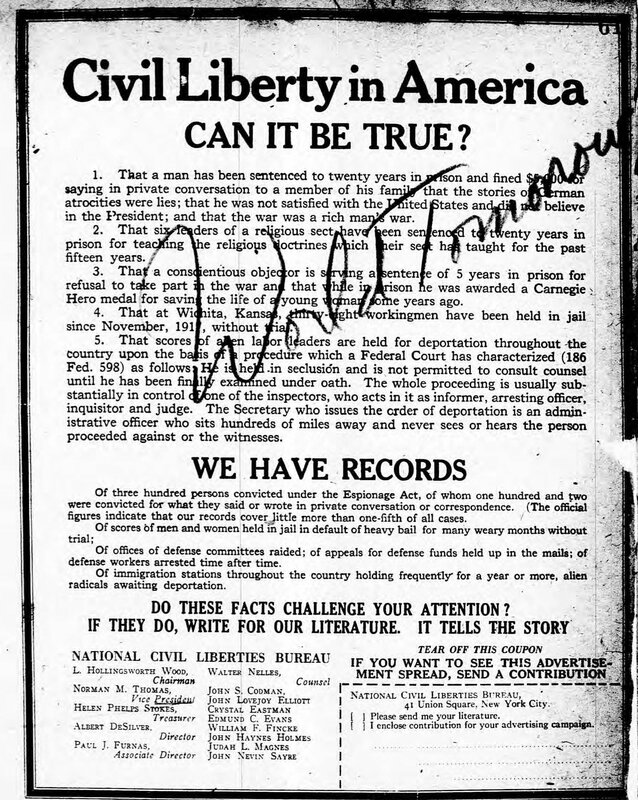 This entry was posted in American Civil Liberties Union History and tagged Civil Liberties Bureau, Crystal Eastman, Espionage Act, National Civil Lib, Roger Baldwin, Secretary of War, Woodrow Wilson by Christa Cleeton. Bookmark the permalink.